This is the outer load bearing belt of the SET War Belt system. This is for users who want a second belt with a different loadout, or for users who do not intend to use the padded portion of the system. The Hypalon inner belt is purchased separately and can be found here. 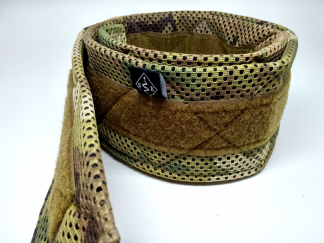 A 1.75″ Cobra Duty Belt made from Type 13 parachute webbing and Cobra Buckle. This is the part of the system that carries the load. The Duty belt is constructed with two layers of webbing for the perfect balance of rigidity and flexibility and has our standard 2″ channel next to the Cobra buckle for clipping carabiners through. On the back side is where it is different. 1″ reinforced hook velcro is sewn down in 2 1/2″ increments creating MOLLE compatible channels. This allows the operator to install gear without interfering with the velcro interface. Of course any gear that would normally be used on a 1.75″ or 2″ belt can still be utilized. Add a D-Ring Cobra Buckle to this belt here. Need it fast? Rush orders available here.